SPDR Gold Shares has launched a new campaign created in partnership with the World Gold Council and State Street Global Advisors. The campaign, created by The Gate, New York, features print and digital ads, with images and content taken on-site at an active gold foundry. Digital includes a mini-documentary video that takes viewers behind the scenes in the foundry and provides insight into the precision-driven process of making gold bars. As part of the campaign, digital ads will incorporate gamification aspects that provide information, up-to-the minute information on gold and its market value. "SPDR Gold Shares let you invest in actual bars of gold. So we thought it would be interesting to peek behind the curtain and see them being made," said David Bernstein, executive creative director at The Gate New York. "It's an insider’s view of one of the most sought-after objects on earth." 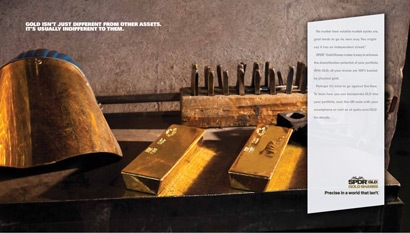 The print ads personify gold and include color photo images straight from the foundry with interesting facts on gold. Another ad reads: “It doesn't take a red hot furnace to keep us in a liquid state,” and shows liquid gold being poured into molds. Each print ad features copy on the importance of gold in portfolio diversification and the precision of SPDR Gold Shares, as well as an interesting fact about gold, such its melting point temperature or the weight of a bar of gold. The campaign, part of The Gate’s ongoing “Precise in a World that isn’t” campaign for State Street, will appear in major financial and business publications and Web sites such as Barron's, Seeking Alpha, The New York Times and The Wall Street Journal.